I love my cloth diapers. They’re soft, they’re adorable, and they have saved my family tons of money. It does take some time to troubleshoot cloth and one challenge is figuring out where to store the diapers once they’ve been wet or soiled. When I first started cloth diapering, I simply used my small trash can that served as a diaper pail when we were using disposables. Since the trash can used grocery sacks as trash can liners, it was so small that it only held about a day’s worth of cloth diapers, if that. It became quite a hassle, but I also had so few cloth diapers that I was washing every day anyway, so it wasn’t too bad. Now that I have about three times as many cloth diapers, grocery sack diaper pails would never cut it. When I was pregnant with my second baby, Andrew, I finally settled on hanging diaper pails as the best method for me. I love both of my hanging pails so much and I have no idea how I made it without them. Not only do they simplify cloth diapering, but they also remove the biggest problem most people have with cloth diapers, the odor. This is the first hanging diaper pail I bought and it’s my husband’s favorite. It retails for around $20, although I think I bought it for around $15 over a year ago. I went with the buttercream color shown above, so that I would have a gender neutral color that nicely matches the buttercream color in my baby bedding. It’s a very simple wetbag made out of PUL, like most cloth diapers. It’s really large and holds about 24 cloth diapers. You can use it to line a diaper pail or you can use it as we do, hanging on a door near the changing table. It has a zipper on the bottom to make it easy to dump the diapers into the washing machine with no contact with the dirty diapers. Oddly enough, because it’s open at the top, the odors are not bad because they’re not closed up all the time. It also has a small terry cloth patch inside that you can put a dab of essential oils on to control odor. This is a tip I learned somewhere on my cloth diapering journey. A good quality tea tree oil is wonderful at controlling odors in your diaper pail. 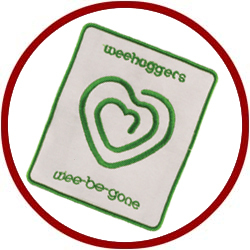 You can put a bit onto a cloth wipe or a wash cloth to help with odors and then wash the cloth with the dirty diapers, since tea tree oil is great at killing bacteria. 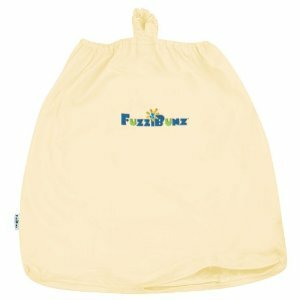 With the FuzziBunz cloth diaper, I can put the oil right onto the little tab inside the bag. The tea tree oil works so well that a cloth diapering friend came over and her first comment when she walked into the nursery was “I don’t smell anything! How do you do that? ?” That’s the real test of odor control! 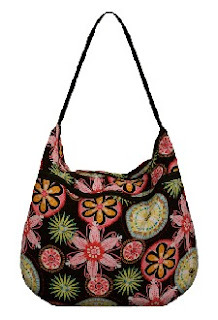 I love the FuzziBunz bag because it’s huge and the zippered bottom makes laundry a breeze. My husband loves it because he uses the shake it out method of removing the inserts from the diaper. Basically, you hold one small corner of the diaper and shake the thing to death to get the inserts out, so you never have to touch the wet insert. All it takes is one look at the two pictures to figure out which wet bag I love! I received this one as a baby gift from a dear friend who also uses cloth. She let me pick out which one I wanted, and I went with the ModBeads, again so that it would be fairly gender neutral. At around $30, this one is definitely more of a splurge, but the perks of it are wonderful. First of all, it has a nice thick pul lining, covered with a fabric that’s much more adorable than the FuzziBunz pail. It is also large, but it only holds about 10 or 12 cloth diapers. It has a zipper at the top, which makes this an especially good one for traveling (if you’re brave enough to travel with cloth diapers). But here’s the best part. Inside, it has a charcoal patch that completely absorbs the ammonia-like smell of urine. If you’re skeptical, please, just trust me. This thing works. If you’re a crafty mama, like several of my cloth diapering friends, then you can always make your own hanging diaper pail and sew one of these Wee-be-gone patches into it. At $7 a pop, they’re totally worth it. You can buy one from Pinstripes and Polkadots. If you made your own, you could combine the functionality of the FuzziBunz bag with the adorable look and odor control of the Wee Huggers and end up with the perfect wet pail. Where do you keep your dirty diapers until wash day? Do you have any tips for reducing odor? This post is part of The Humbled Homemaker’s Healthy 2Day Link-Up as well as Raising Homemaker’s Homemaking Link-Up. Very interesting–I have the FB bag as well and have used it for a year. The smell got to be too much for us. (It’s hanging in our closet-like laundry room, right beside the living room.) I recently replaced it with a Planet Wise hanging pail and LOVE it! Thanks for sharing w/ Healthy 2Day Wednesday! Hope to see you back next week! This is good quality of bag. In this bag holds about 24 cloth diapers just excellent so i think this bag used to travel. This is best way for give baby gift. I like it. We have been usng expensive diapers since our baby was born and we have never had an issue. Our baby has never had any rash and the diapers never leaked (and there were mornings when we were amazed by the extra weight they had taken on).